Unfortunately, it often seems to be the case that when issues arise the best course of action is to open a ticket with Amazon Seller Customer service, as they will be able to delve deeper into the issue. And remember, it is vital to keep a record of everything, including postage receipts and all correspondence, in case it is needed as proof at a later date. One of the first things to assess is how long the customer has to return an item as per Amazon's regulations. As a marketplace Seller you have the right to determine how long to set your dates for as long as it is better or equal to Amazon's standard policy. This means the buyer has 30 days from receipt to return the product. Keep in mind that over holiday periods Amazon will sometimes extend their return dates (for instance over Christmas they usually allow returns until the end of January) but marketplace sellers do not have to match this. If the item is faulty or not as advertised, the customer has the right to return the item with all costs covered by the Seller within a 'reasonable period' of time based on the category and value of the item. Some problems can arise due to the vagueness of this statement and Sellers are reporting people returning items up to three months later. In fact, Amazon states that only when it gets to the six month mark must the buyer prove that the fault did not occur during that time. As this is a legal warranty there is not much a Seller can do to avoid this. However some actions that can be undertaken are to staying diligent about the quality of their products, sending follow up emails to buyers to check everything is okay with their product and looking out for fraudulent claims. If you do believe it to be fraudulent the best thing to do is open a ticket with Amazon Customer Service who may look into the customer, but this is likely to only be successful if this is something the customer has done multiple times. Amazon has fairly standard expectations when it comes to the differences in what the Seller must pay depending on the reason for return. Obviously, in all cases, as long as it is returned within the 30 day window (or more if you offer it) the actual product itself should be refunded. If the product was returned because it is defective, damaged or not as described the Seller must refund both the original shipping and the return shipping. Any other reason and the customer must cover both original and return shipping costs. However, there are two exceptions to this; One, if the customer contacts the Seller within 14 days of receipt of the item, legally the Seller must cover the original shipping cost but not the return cost; Two, if the item is clothing, shoes or handbags the Seller is obliged to cover all refund cost with any reason for return. It used to be that only FBA items followed Amazon's policy in which customers are automatically refunded before the item has even been returned - in fact, customers have up to 45 days after this to return the item which can lead to inventory problems for many sellers. However, as of October 2017 Amazon introduced automatic refunds for FBM sales, as well as automatically sending out labelling for returns for the buyer. This has caused many FBM sellers to worry about getting hit with automatic returns where they previously could have had discussion with the buyer to resolve the issue. Another worry in this category is that some items are deemed refundable but not returnable. This means in certain cases the buyer will be able to keep the product and get a full refund, leaving the Seller out of pocket. 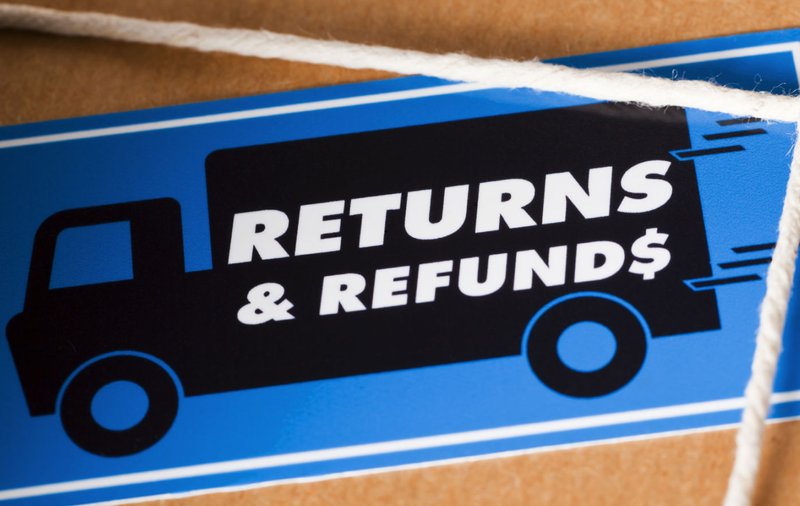 The same rules also apply with the reason for return, meaning that if the customer is returning for any reason other than it being defective or not as described they must handle the shipping costs. Another thing to take into account when dealing with returns on Amazon is your RDR (return dissatisfaction rating). This measures customer satisfaction on how their returns are processed. The rating is based on the percentage of valid return requests that were not answered within 48 hours, were incorrectly rejected, or received negative customer feedback. Late Response Rate: Amazon sellers must respond to return requests from buyers within 48 hours. Invalid Rejection Rate: % of in-policy return requests that are incorrectly rejected. Sellers will then be graded according to these metrics and will be given either a green tick, a yellow exclamation mark or a red X. Should you have a red X it's important to take immediate action to improve your service. Start by reviewing how you handle your return requests - make sure you always keep in communication with your customers so you are able to fully understand the request and handle it appropriately. And remember, try not to argue with the customer but have a valid discussion. If a customer is unhappy with the reason that you have turned down or handled their return request they can open an A-z claim with Amazon. Again, Amazon tends to favour the customer in these cases but there are ways to try and win the claim. Before you embark on this, however, make sure that what you are saying is completely valid and the customer has no reason to have opened the claim. Here are some tips on the best way to respond. Make sure you respond on time and through the online form. If you don't respond within 40 hours you will instantly lose the case, but the faster you respond the better. Be courteous but to the point. If you have a valid dispute with the claim don't be afraid to argue your case. Keep your responses to the point and only give the amount of information necessary. Offer a refund. Make sure to emphasise that you will happily offer a refund upon return of the item should it be the appropriate course of action. Know Amazon's rules. If you follow Amazon's rules and make sure your items are shipped and received correctly you will have a much higher chance of winning any A-z claims. If you are not at fault Amazon should see that when assessing the claims. In the end, getting return requests is both about making sure you know everything about Amazon's procedures and keeping your customers on side by being timely and courteous with your correspondence. Keep these rules in mind and you should be able to make return requests as stress free as possible.